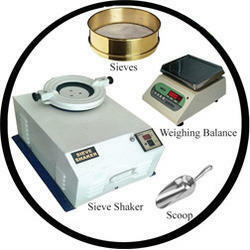 We are offering below list of products for analysis of particle size of soil. - Sieve Shaker (Gyratory) - 1 pc. Compact model with digital display, Dia.- 20cm. - Test Sieves - 6 pcs. 200mm dia., made of brass frame with SS wires mesh of size 4.75, 2.36, 1.18, 0.6, 0.300, 0.150mm. Expert Vision Labs Pvt. 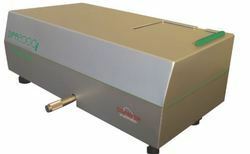 Ltd.
Laser Particle Size Analyzer : Without built-in Ultrasonic Probe. Sample Feeding : Wet Dispersion, Circulating Sample Feeder & Static Sample Cell. Geology: Soil, clay, sand, kaolin. Environmental: Ocean water, tap water, waste water, dust, membrane filtration, flocculation. We offer SALD-2300 Laser Diffraction Particle Size Analyzer with windows based operating system.